- At air-gap: s.w.l of lifint mm kw v kgs a/300 kgs b/100 kgs chain kgs. BILLET SIZE : 100mm × 100mm × 6/12mm = 10 Nos. BILLET SIZE : 130mm × 130mm × 6/12mm = 08 Nos. - Most suitable for EDM, Wire cut and similar applications. - Enables grinding of thin and small work pieces that hitherto presented problems in holding. - Stable magnet grid movement provides highest precision grinding. We are the renowned manufacturer, supplier and exporter of rectangular lifting magnets. Our rectangular lifting magnets are widely used for lifting scrap and other forms of ferrous materials. In addition, these rectangular lifting magnets also crush the clinker during skull cracker ball operations. 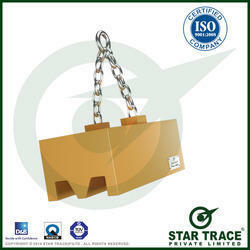 We are involved in offering Rectangular Magnetic Chucks. The offered magnetic chucks are made by our professionals using high grade raw material and advanced technology. Due to their compliance with the international quality standards, these chucks are widely appreciated amidst our customers in the national and international market. 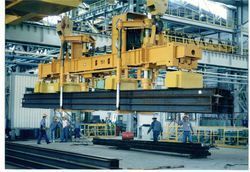 Area of Applications: Steel warehouses, shipyards, fabricators, and metal working plants. Working temperature: 80~240 Degree cel. Working temperature	: 80~240 Degree cel.